A French woman has been kidnapped by an armed gang on Kenya's northern resort island of Manda and taken to Somalia, Kenyan officials say. The disabled woman, 66, was attacked at her bungalow at Ras Kitau. Kenya's government said it believed the abductors were al-Shabab militants. A Kenyan statement said some abductors were injured in a shootout with two Kenyan ships trying to stop them. Gunmen shot dead husband David Tebbutt and kidnapped his wife Judith in Kiwayu. She was taken across the border to Somalia. The gunmen struck at Ras Kitau at 03:30 (00:30 GMT) on Saturday. "An elderly, disabled French lady who has been living in Manda Island in her own house was abducted by 10 heavily armed Somali bandits suspected to be al-Shabab operatives from Ras Chiamboni in Somalia, near the Kenyan border," a Kenyan government statement said. This was a far more audacious raid than the one against David and Judith Tebbutt at Kiwayu. Ras Kitau is just opposite Lamu Island's popular Shela beach so this attack goes right to the heart of Lamu's tourism industry. This time the gunshots were heard in Shela village and will have scared tourists and hotel owners alike. On an island where almost all job opportunities are related to tourism this is very bad news. One hotel owner told me Somali gangs in boats had been seen at least twice in the last 10 days close to Kiwayu. He has closed the resort. Whatever the outcome of this latest kidnapping, there is now a desperate need for the Kenyan government to launch a major security operation and stop the gangs from getting anywhere near these resorts. It will not be easy but it has to be done in order to make the tourists feel safe, save jobs and keep the foreign exchange coming in. Abu Chiaba, a local legislator, said the gang had come into Manda by boat in the middle of the night. "The elderly French woman is well known in the area, she comes to Manda regularly," Mr Chiaba said. Witnesses say they heard at least two gunshots before the woman was taken away by the attackers. "We were all startled awake because there were gunshots," said Jeremiah Kiptoon, who works on Manda island. "The dogs were barking and people were screaming... I ran to the place to see what was happening but by the time I got there, the lady was gone." Two coastguard vessels and a police helicopter chased the abductors, and were involved in an exchange of fire, Internal Security Minister George Saitoti said in a statement. He said several of the abductors were injured but they still managed to enter Somali territory in a motor boat. The government said "every effort" was being made to rescue the woman. Kenya's Tourism Minister Najib Balala called for international assistance to help them in their efforts to secure the border with Somalia. Media captionKenyan tourism minister Najib Balala: "All the security officials in Lamu have moved to Kiunga where they are going to beef up the security on the border line"
"The core problem is Somalia and the core problem is criminal elements who manage to sneak into the country," he told the BBC. "Whatever we're going to do, if we don't have the support of the international community to address the Somali issue then it is very challenging to manage to man the border in Somalia." France has warned French visitors to avoid the area. "It is advised against staying on the Lamu archipelago and its region near the Somali border," the French foreign ministry said on its website. 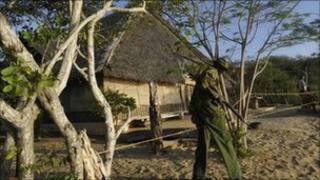 The attack happened just across a lagoon from Shela - an exclusive resort on Lamu island. This attack has the potential to do severe damage to Kenya's tourism industry, the BBC's Will Ross in Nairobi says.